hen men went to sea under sail, Canadian Maritime inshore fishermen used small rowing boats to work in the rock-strewn coastal coves and inlets. Some boats were double-ended, with a stem fore and aft, while others had transoms as dictated by the ethnographic characteristics and traditions of the areas in which they were built and used. 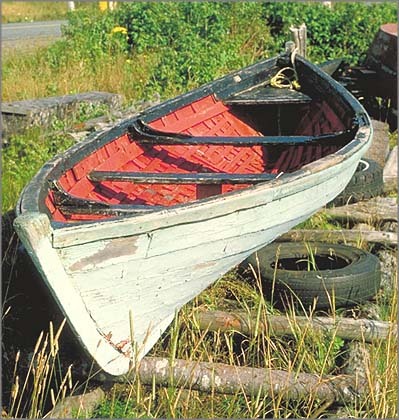 Regional traditions prevailed throughout Nova Scotia where most boats were clinker-built, though builders in some localities preferred smooth-hulled carvel-planked boats. Larger inshore fishing boats were fitted with sails but were still small enough to be rowed whenever the winds dropped or were unfavourable. No special fittings or mechanical adaptations to assist fishing were used in the sailing era, as mechanical power was not available aboard the smaller craft. These boats also reflected the individual characteristics of their locale and could have fixed keels or folding centreboards, as well as variations in their overall shape and rig. What is significant is that the sailing craft of the province were varied and bore the individual dictates of their heritage, indigenous materials, local waters or prevailing weather conditions. Traditional characteristics, methods of construction, and regional differences all but disappeared at the start of the twentieth century with the arrival of the gasoline engine. An old, double-ended rowing boat, today sometimes called a 'gunning skiff'. This was the type of clinker-planked boat used for lobstering and for fishing close along shore before make-and-break engines were introduced.